When I first started writing Couture Girl, my blog design was the one thing that really bugged me. I'm the least tech savvy person ever so to say I didn't have a clue would be an understatement. I read so many blogs that had pretty designs and I was stuck with my dodgy photoshop job (I so wish I had a photo of it - major cringe to say the least!). I eventually came to the conclusion that everyone was clearly better with technology than I am and I gave up trying to make my dodgy photoshop effort look any better. I have to say it got me quite down at one stage - its very frustrating to put all that effort into your content but not being happy with how your blog itself looks. After all, a blog design is the first thing potential new readers will see so its important its pleasing to the eye and easy to navigate. I know for me personally if I come across a blog with a pretty design I'm a lot more likely to hit that follow button. Thanks Kayleigh, and a big hello to all of your lovely readers! Today I would like to take the opportunity to say a huge thank you to you and your amazing followers for supporting me in one way or another over these past few years while I established my blog design portfolio and set up my custom design business. If it wasn't for all of you guys I might not have had the courage to pursue my business idea in the first place, so I think it's about time that I give something back to this wonderful community who gave me the encouragement and support that I needed. As I am constantly receiving emails from readers complimenting the work that I have done on Kayleigh's past and present blog designs, I figured what better way to give back to you guys than to offer up my custom blog design services! 1st Prize: 1 x FREE custom blog design valued at $70 AUD! (Basic Blog Design Package, includes installation). 2nd Prize: 1 x $50 voucher for my custom blog or website design services (Prize is non transferable, not redeemable for cash). 3rd Prize: 1 x $20 voucher for my custom blog or website design services (Prize is non transferable, not redeemable for cash). - The giveaway will run for one week from today 29/11/13 until 06/12/13. - Design services are for blogger blogs only. 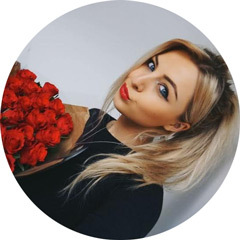 - You must be a follower of both mine and Felicity's blogs via Bloglovin' in order for your entries to count. - Please don't create an account just to enter this giveaway as your entries will be removed. - The winners will be contacted within 24 hours of the giveaway closing, and if they haven't gotten back to us within 48 hours, another winner will be chosen. So now you know what you can win - its time to get entering! Just use the Rafflecopter widget below to enter - there's only three mandatory enteries so its really straightforward! We've also included lots of other optional enteries which you can do if you'd like to up your chance of winning! I'm so excited to announce the winners of this giveaway - having a pretty new blog design in time for Christmas is such a lovely treat! As if Felicity isn't being generous enough already, she's also offering 20% off her blog design services until the end of December with the code 'CoutureXmas20'. Yay! I love the third design! The blog design she did for 'Imperfect beauty' blog is my favourite! I love the first design as it has a really vintage feel to it. I think it would look amazing in red, black and white! I've been obsessed with her designs for so so long. This is a great gieveaway!!!! And my fave design is the imperfect beauty one! Fab giveaway - shame it's for Blogger sites only, but hey ho! 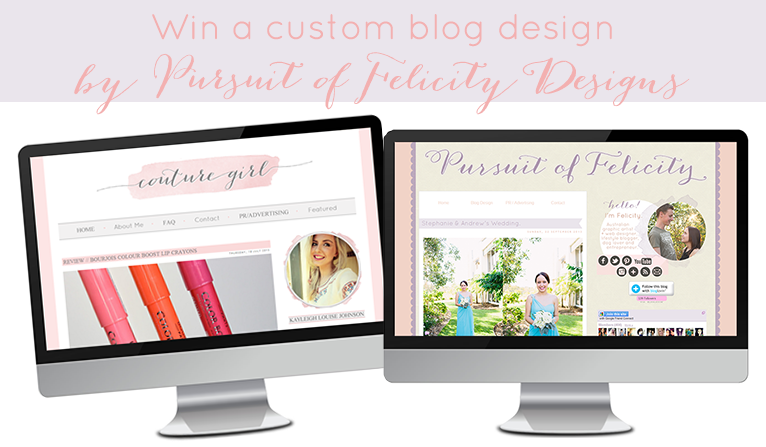 I like the design for Pursuit of Felicity Designs. Wow! What an amazing giveaway! I have recently started blogging and to have an amazing design will really help me to get to the stage I would love to be at! I'm so useless with HTML coding I have no clue about any of it so this would really be amazing! My favourite design has to be J4mieJohnston's the colour is really pretty and I love the layout! all of her designs are amazing! i'm so not tech savvy so when it comes to web design, i literally have no clue! It would have to be Polka Dots and Whispers because of the Typewriter! Hi, I love j4amie johnston's design that you have made for her, I absolutely adore how it looks but I also really like Kayleighs as I adore the colour scheme! To be honest, I like each and every design that you have done but those have to be my top 2, although they are all stunning, great work! This is such a good giveaway! My favourite was the 'Simple Sew' design! Would love to win this, whoever does is very lucky! I like the current design! I love the current design <3 it's adorable! I love the first design! This is a great giveaway! Absolutely loving the blog and web designs. I love the blog design for Dressed in the City's blog. Hope to win because I'm NOT very technical at all!! I like the Sunshine and Showers design :). Thanks for the giveaway!! LOVE them all! But I definitely have a little thing for "Sunshine and Showers"
Loving sew simple and the fashion it list, so clever!!! My favourite design has to be the one for Felicity's blog - it's beautiful. Such a great giveaway idea :) I love the design for Felicity's blog - it's so simple yet brilliant and I love the colour scheme! Love this giveaway! My favourite has to be Sunshine & Showers, it looks so elegant! EEEEK! I love the lovely Beauty Excel design! SO SWEET!!! Amazing giveaway! Would love this. All the designs are stunning and there is no way I could do this by myself! You are one talented lady felicity. I love how femenine and cute they are! I've been to your blog several times because of Cotour Girl and every time I've admired your work! Thank you for the oportunty!! What a fantastic giveaway! My poor blog is so drab and dreary so I have all of my fingers and toes crossed! After checking out Felicity's portfolio, I love Coture Girl's design (obviously!) and I also love the design for Sew Simple :) so many cutee designs to choose from though! I had a bit of trouble with the Rafflecopter thing, meaning that I had to start again as my internet crashed - I hope that doesn't mess up my entry! I love Couture Girls design (obviously!) and also Investment Buy. Both are simple but really pretty and it was so hard to pick them out of all of the designs! Great information about website design.